Hendersonville, TN (March 7, 2008) - Daywind Records is pleased to announce the addition of Aaron and Amanda Crabb to the Daywind family of artists. 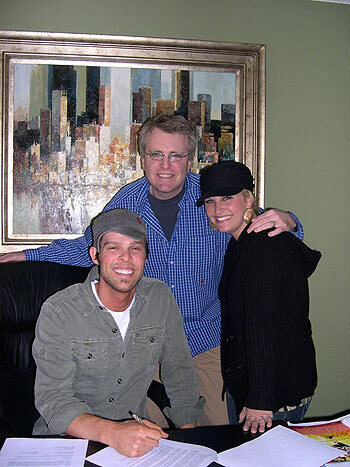 This dynamic husband and wife ministry team met with label president, Ed Leonard, yesterday to make it official. The debut album, After The Rain, soon to be released nationwide, features incredibly powerful songs, all written by Aaron and Amanda. Their diverse musical style reaches across genres and centers on worship. Their break out single from the album, “Miracle,” is impacting radio nationwide. Aaron and Amanda Crabb are booked by The Beckie Simmons Agency. Visit www.bsaworld.com for scheduling information. Daywind Records is based in Hendersonville, TN, and is distributed worldwide through New Day Christian Distributors. In addition to Aaron and Amanda Crabb, Daywind is home to such great artists as the Booth Brothers and Brian Free and Assurance, among others. For more information on Aaron and Amanda Crabb, visit www.aaronandamandacrabb.com. For more on Daywind Records, visit www.daywindrecords.com.